There is, seriously, no better sauce for fried fish and boiled potatoes than sauce remoulade. 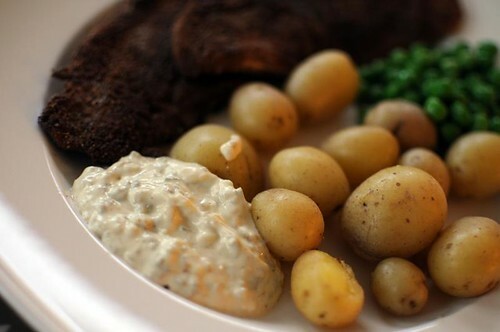 There are many recipes, but most of them include mayo, chopped pickles of some sort, and at least all the Danish recipes contain a little dash of curry powder. This is mine. Finely chop the capers, pickled onions and cornichons. Whisk together all the ingredients, and season.